Regalia dating to before 1850 are scarce, although surviving pieces have not yet been subject to detailed investigation. However, from the earlier tradition, a pineapple or a bunch of grapes were used to symbolise the skill of a gardener. Only a master had skill to cultivate the fruit in 18th century Scotland. Compass and square symbols appear in 19th century free gardener regalia, leading to a natural confusion with freemasonry. However, in gardener connections are shown by an open clasp knife crossing the compasses. 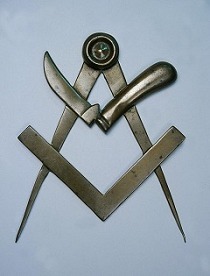 The compasses (submission to the rules), the square (squaring moral actions) and the pruning knife (cultivation of one's mind and the embrace of brotherly affection) had the meanings indicated. Free Gardeners based their creation story on Biblical references. Coded allusions to the mythology appear on many articles of regalia. It was coded because only 'initiates' were admitted to the 'correct' interpretations of the symbols. The letters PGHE are code for the four rivers (Pishon, Euphrates, Gihon and Hiddekel) that flow through the Garden of Eden. A further letter group, ANS, symbolises a word of recognition appropriate to each degree - Adam, Noah and Solomon. These letters are often accompanied by embroidered or gold braid depictions of Adam and Eve in Eden, Noah's Ark, doves and the rainbow after the Flood. 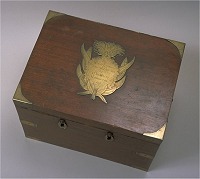 In the 19th century all the similar organisations competing for members tried to spread their own 'creation story' to highlight their uniqueness and build brotherhood and fraternity. However, many of the new enthusiasts were already freemasons and they brought with them a tradition of 'correct' symbols and styles. As these were universally recognised, older local forms were often discarded. 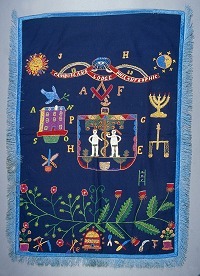 The commercial suppliers of Masonic regalia helped spread conformity. In Scotland Vernal of Glasgow and Jockel of Edinburgh simply adapted for free gardeners what they made already for freemasons. They kept the Masonic design and just changed the decoration as necessary. By the end of the 19th century almost all regalia was being provided from one or other of the 'Masonic warehouses' and local or homemade articles were no longer used.